John Morton (c.1420 – 15 September 1500) was an English prelate who served as Archbishop of Canterbury from 1486 until his death and also Lord Chancellor of England from 1487. He was elevated to the cardinalate in 1493. Born in Dorset, he was probably educated at Balliol College, Oxford. After graduating with a BCL in 1448, he practised law in ecclesiastical courts, including the Court of Arches, being appointed rector of Shellingford (Berkshire) in 1453. He was made prebendary of Sarum in 1458, rector of St. Dunstan's (in the West), archdeacon of Norwich circa 1460. He became a government lawyer with the Lancastrian party and drafted the Bill of Attainder against Richard, Duke of York in 1459. He was captured after the Battle of Towton and attainted, but escaped into exile, joining Queen Margaret in France, where he was Keeper of the Privy Seal to Henry VI in the Lancastrian government in exile and graduated in theology from the University of Louvain in 1469. He returned to England in 1470, but following the failure of the Readeption and the murder of Henry VI, he made his peace with Edward IV. He received a royal pardon in July 1471, and became a Master of Chancery that Michaelmas, and Master of the Rolls in the following March. Further church appointments followed, as Archdeacon of Winchester and Dean of the Court of Arches in 1474, canon of Wells from 1475 to 1478, archdeacon of Berkshire in 1476 and archdeacon of Norfolk in 1477. He was appointed Master of the Rolls from 1472 to 1479. In February 1477, he was sent by the Yorkist King Edward IV, together with Sir John Donne, as ambassador to the French court. After serving a short spell in 1478 as Archdeacon of Leicester he was appointed Bishop of Ely by King Edward on 8 August 1478 and he was consecrated on 31 January 1479. Between 1478 and 1483 he had replaced the bishop's palace on the site of Wisbech Castle with one built in brick and Ketton stone. He was also responsible for cutting of 'Morton's Leam' from Stanground to Guyhirn improving the navigation and drainage of the Fens. Morton was an important foe of the Yorkist regime of King Richard III and spent some time in captivity in Brecknock Castle. After the dynastic change to the Tudors in 1485, King Henry VII made him Archbishop of Canterbury on 6 October 1486, and appointed him Lord Chancellor of England in 1487. In 1493 he was appointed Cardinal priest of the church of St. Anastasia in Rome by Pope Alexander VI. In 1485 he built the residence of Ely's Bishop which, later, will become "Old Palace" of Hatfield Palace, on the ancestral soil of a residence of Ely's Bishops. This manor will be chosen by Henry VIII, to be the nursery of his children, the place where, notably, Queen Elizabeth I spent much of her girlhood. Morton died at Knole House, Kent, on 15 September 1500. His monument was placed in the south-east part of Canterbury Cathedral's crypt, with an effigy and an arch decorated with angels, cardinal's caps, and tun barrels inscribed with MOR (a pun on his name, Mor-ton). However, this monument is a cenotaph since his actual body was buried in the crypt's central chapel of the Virgin Mary, according to his wishes. "The Arms given him in Anglia Sacra, p. 673, are not sufficiently explicit; they should be thus blasoned: Quarterly gules and ermine on the 1st and 4th a goat's head erased argent. And this agrees with his arms carved various times on the noble Tower of Wisbeche Church, and as they were formerly in a window of Linton Church in Cambridgeshire, as I have it in a manuscript of church notes taken above a century ago. However these accord not with those for our bishop in his own cathedral twice, viz. in the east window of the north aisle of the presbytery, and in another window of the same aisle, where they are still remaining, and are thus blasoned: Quarterly gules and ermine, on the 1st and 4th three goat's heads erased argent, attired or. In the 1972 BBC television series The Shadow of the Tower, which focused on the reign of Henry VII, Morton was played by Denis Carey. In the Netflix/Canal series "Borgia," Morton appears in one scene in season 2, episode 4, and is portrayed by David Gant. ^ Miranda, Salvador. "John Morton". The Cardinals of the Holy Roman Church. Retrieved 8 October 2010. ^ "Alumni Oxonienses 1500–1714". British History Online. Retrieved 29 May 2012. ^ George Anniss (1977). A History of Wisbech Castle. EARO. ^ "The Shadow of the Tower". IMDB. Retrieved 26 June 2016. Wikimedia Commons has media related to John Morton (cardinal). John Alcock was an English churchman, bishop and Lord Chancellor. John Stafford was an English statesman and prelate who served as Lord Chancellor (1432-1450) and as Archbishop of Canterbury (1443-1452). The Bishop of Ely is the ordinary of the Church of England Diocese of Ely in the Province of Canterbury. The diocese roughly covers the county of Cambridgeshire, together with a section of north-west Norfolk and has its episcopal see in the City of Ely, Cambridgeshire, where the seat is located at the Cathedral Church of the Holy Trinity. The current bishop is Stephen Conway, who signs +Stephen Elien:. The diocesan bishops resided at the Bishop's Palace, Ely until 1941; they now reside in Bishop's House, the former cathedral deanery. Conway became Bishop of Ely in 2010, translated from the Diocese of Salisbury where he was Bishop suffragan of Ramsbury. 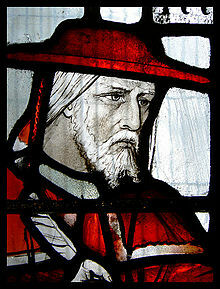 John Hales was Bishop of Coventry and Lichfield (1459-1490). He was one of the Worthies of Devon of the biographer John Prince (d.1723).